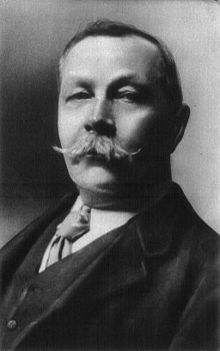 Sir Arthur Ignatius Conan Doyle (May 22, 1859 – July 7, 1930) was a Scottish writer and physician, most noted for his fictional stories about the detective Sherlock Holmes, which are generally considered milestones in the field of crime fiction. At the age of nine, Doyle was sent to a Roman Catholic Jesuit preparatory school. From 1875 to 1876, he was educated at a Jesuit school in Austria. By the time he left, he had rejected religion and become an agnostic. From 1876 to 1881 he studied medicine at the University of Edinburgh Medical School and later studied ophthalmology in Vienna. In 1890, he moved to London where he set up a practice as an ophthalmologist. Following the death of his first wife and his son Kingsley, Doyle sank into depression. He found solace supporting Spiritualism and its attempts to find proof of existence beyond the grave. In particular, he favored a form of Spiritualism that followed the teachings and example of Jesus of Nazareth. He was also a member of the renowned supernatural organization The Ghost Club. Doyle died of a heart attack at the age of 71.